Just posted this on my blog, it's so simple and quick I don't even know if you can call it a recipe! Mix everything with a spoon or with your hands (except stevia and cocoa). Add more water if the dough is too dry. 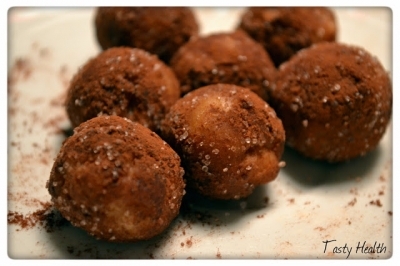 Roll into balls and cover with cocoa and stevia. Put in fridge for a little while before you eat.